How to wear the slouchy look in SPANX Leggings AND win a voucher plus an invite to our store launch party! When we look for style inspiration we tend to pay extra attention to the outfits that exude an effortlessly cool vibe. It’s not easy describing exactly what gives an ensemble its je ne sais quoi, but we’ve come up with these tips that will elevate you to cool-girl status. Check out how to achieve the unstudied look, and shop the essentials to get you started! First you’ll need the quintessential winter legging, the Spanx Cropped Faux Leather Legging. Then you’ll need to pair these with a slouchy sweater or vest with stylish and some separates, like a leather jacket, which gives your ensemble an unstudied vibe. 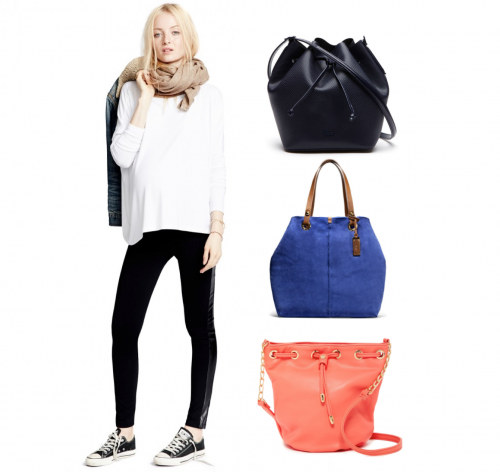 To finish it off, pick a big statement bag. Now you tell us, which bag goes best with this look and why? Tell us and we’ll feature you in our next blog post where you’ll have a chance to give some style advice to our fashion loving community. Oh, and you’ll get a R200 voucher to spend on SPANX at Inner Secrets Lingerie with a hot invite to their store opening in May. And, GO! Comment with the colour of the bag you think looks the best. One Response to How to wear the slouchy look in SPANX Leggings AND win a voucher plus an invite to our store launch party!